I thought this was just going to be a fancy hummus . . . 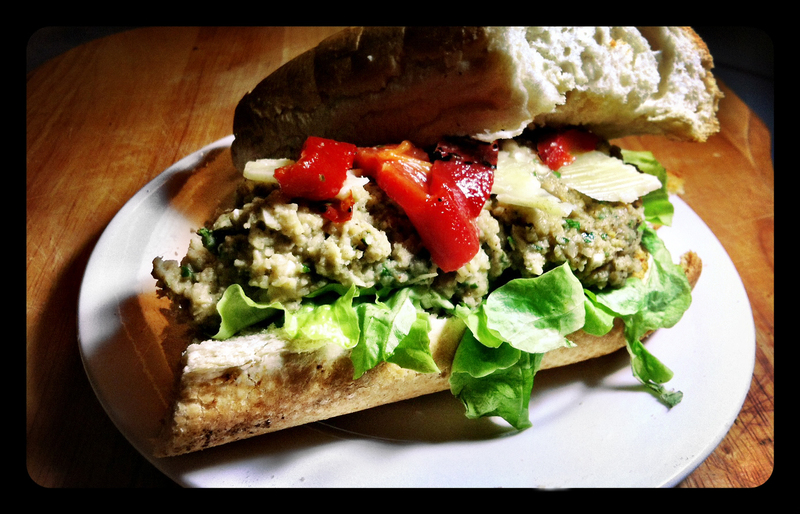 I found this recipe for Warm Artichoke and Chickpea Pâté on the Huffington Post website and thought it would make a good filling for a wintertime sandwich. Much to my surprise and delight, the artichoke pureed with the chickpeas, along with the other spices and herbs, gave the pâté a texture and flavor very different from what I was suspecting. It turned out much creamier, and had a consistency similar to tuna fish salad (if I am remembering tuna fish correctly). In fact, I think this pâté would probably make a great vegetarian tuna melt alternative. Artichokes are actually the bud of a large flower head before it comes into bloom; once the flower blooms, this bud becomes stingy, coarse, and barely edible. Both the ancient Greeks and Romans ate artichokes, and it is a popular ingredient in Mediterranean cooking. The heart of the artichoke is the softest, the best part to eat, and most often used, but often the outer leaves can be cooked and eaten as well. For me the surprising ingredient for this recipe was the use of Chinese Five Spice Powder. This mixture of star anise, cloves, chinese cinnamon, sichuan pepper, and fennel seeds is not something I cook with often, and I was unsure how well the flavors would combine with the artichoke. In fact, both fennel and anise are flavors that I do not really like very much, but I figured when it comes to unknown spices, it is always worth trying a recipe the first time how it is written and you can always change it up a bit later. I am glad I did, because the recipe works very well seasoned with these spices, and it would not normally been something I would have tried. You can use this recipe for the chickpea and artichoke pâté on its own, as a topping for crackers, or in a sandwich as I did. It would be gluten free and vegan without the bread or the cheese I used, and these items can easily be swapped with gluten free or vegan substitutions . Drain the chickpeas and artichokes. Roast the five spice in a hot, dry pan until fragrant. Blend all the remaining ingredients to a fine purée. I found this easiest to do with my stick blender directly in an oven proof dish. Transfer the mixture to an ovenproof dish, if you are not using a stick blender, and then bake for 10 minutes, or until heated through. Cut a length of baguette to your desired size, and slice it open. Toast baguette in the oven while warming the pâté. To build the sandwich: Place the lettuce and a thick layer of the warm pâté onto the toasted baguette, and top with the sliced roasted red peppers and shaved parmesan cheese. Continuing this weekend’s theme of finger-food, tapas, small plate type recipes . . . I present the Crispy Potato & Parmesan Puff. This recipe, originally from the How Sweet It Is blog, caught my attention because they idea of potato and parmesan cheese combined together into a crispy bite sized treat was just too good to ignore. 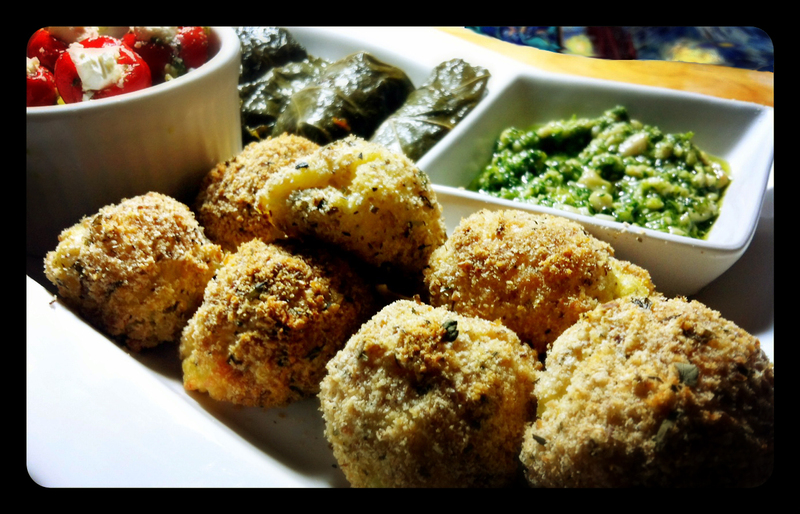 It was the perfect thing to make on a rainy sunday afternoon, and combined with the Feta & Pesto Stuffed Peppadew Peppers , the Dolmades, a glass of wine, and some bread, these little puffs make a great lunch or dinner to graze your way through while chatting with a friend or two. The recipe makes about 70 puffs, but it is easy to halve. Honestly though, I do not think 70 of these puffs would be all that hard to get through. This recipe would be easy to make gluten free by substituting the panko bread crumbs with a gluten free bread crumb alternative. Add potatoes to a large pot of boiling water and cook until fork tender, about 20 minutes. Drain the potatoes and then mash them with salt, pepper, butter and milk. Then stir in parmesan and onions, then place the mixture in the fridge to cool for 15-20 minutes. Preheat the oven to 200 C or 400 F. I would recommend using the fan bake setting, if you have one on your oven. Remove potatoe mixture from the fridge and roll into golf ball sized balls. Dip each potato ball into the beaten egg, then cover in bread crumbs. Place them on a baking sheet about 20mm or 1-2 inches apart, and hit each with a quick spritz of olive oil or cooking spray. Bake for 12-15 minutes, or until outside is crispy. Serve them while still warm with a lemon garlic aioli, pesto or other dipping sauce. Today is my friend’s birthday, and birthdays mean cake . . . This particular friend happens to be both Gluten and Dairy Free, which does make baking a birthday cake a bit of a challenge. 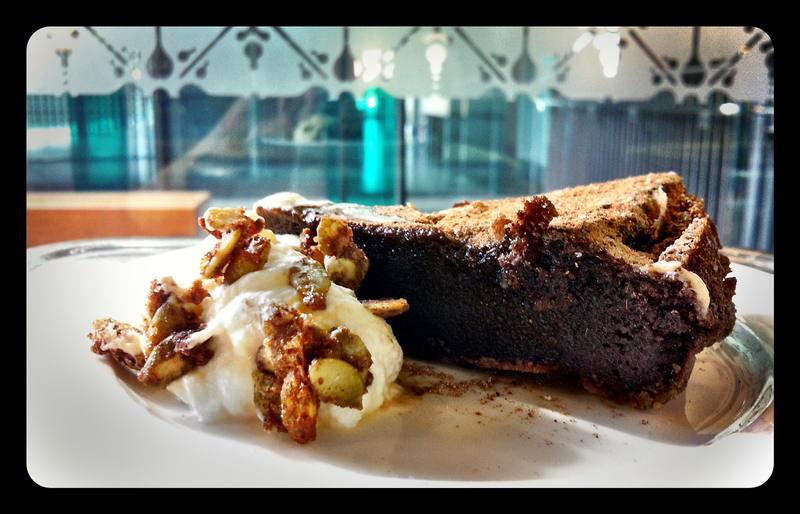 Luckily, I found this recipe for Mexican Hot Chocolate Cake, from Dish magazine, in my collection of untried recipes. Besides being quite yummy, with a few simple substitutions I could easily make it fit her dietary restrictions. The main flavors of this cake are chocolate, chilli, and cinnamon, mimicking the traditional Mexican way of making hot chocolate with these spices. Ancient Aztecs cultivated chocolate for eating and drinking, and the combination of dark chocolate and chilli dates back to their civilization. Hot chocolate was originally created by the Aztecs by roasting cocoa beans, and then using a mortar and pestle to grind the roasted cocoa beans with water. They flavored this drink with chilli, vanilla, honey and pepper. Cocoa beans quickly became a desired crop for the European settlers once they tasted this delicious drink. In the modern westernized world, chilli and chocolate is once again becoming a popular combination amongst us “foodies”. This recipe makes a very rich, almost pudding like cake, that when topped with candied pumpkin seeds and vanilla whipped cream (the birthday girl skipped this part) made a lovely mid morning birthday treat. Grease a 20cm (8″) cake tin, and line it with baking paper. Melt the butter and chocolate in a heat proof bowl set over a pan of simmering water, stirring occasionally, or in a double boiler. If using the bowl, do not let the water touch the base of the bowl or the chocolate will seize. Stir int he sugar and vanilla and leave the chocolate to cool, for about 10 minutes. While chocolate is cooling, put all the ingredients for the candied pumpkin seeds into a bowl and combine well with a fork. Do not beat the egg white until frothy. Spread seed and spice mixture evenly on a lined baking tray and bake for 5-6 ,minutes, turning once during baking. The seeds will be sticky when you turn them, but well become crunchy when cooled. break seed sup into pieces once it has completely cooled. Once the chocolate has cooled, stir in the eggs, and then fold in the flour, salt, cinnamon, and cayenne pepper. Pour mixture into the greased cake tin making sure the top is smooth. Bake for 20 – 25 minutes, until the center is set, but not too firm. This actually took about twice that time in my oven. Just make sure the cake has risen and a knife in the center comes out clean. Transfer to a rack and let cool completely in the tin, where the cake will deflate and set. To serve: Whip the cream and vanilla to soft peaks. Remove the cake from the tin and gently peel off the baking paper. Place on a serving plate and dust with the combined icing sugar, cinnamon, and cocoa powder. Serve with a dallop of cream and a sprinkling of the candied pumpkin seeds. Since the last two days have been quick and simple recipes, I figured I would do something a bit fancier for today’s post. Are you ever in a Doctor’s office or coffee shop flipping through the magazines and come across that amazing looking recipe you want to take home to try? So you very sneakily and quietly, trying not to attract the receptionist’s or cafe staff’s attention, rip the recipe out of the magazine and quickly stuff it into whatever bag or purse you have with you. I know I have done this countless times over the years since I have started being interested in cooking as a teenager. It always leaves me feeling a bit guilty . . . but thank goodness for technology and camera phones; I no longer have this guilt. Now I simply pull my iPhone out a take a picture of whatever amazing looking recipe has caught my attention. This recipe for Spiced Eggplant with Herbed Bulgur Salad, found in January 2012 issue of Bon Appetit magazine, is was one of these recipes that I snapped with my iPhone. Eggplants are a vegetable that is native to the Indian Subcontinent, has been cultivated in southern and eastern Asia, and the first known written record is found in an ancient Chinese agricultural treatise. It is believed that the eggplant was introduced throughout the Mediterranean by the Arabs in the early Middle Ages. The raw flesh of the eggplant can have a somewhat bitter taste, but becomes tender when cooked and develops a rich, complex flavor. Many recipes advise salting, rinsing and draining eggplants to soften it and to reduce the amount of fat absorbed during cooking, but mainly to remove the bitterness that it can have. The flesh is capable of absorbing large amounts of cooking fats and sauces, making for very rich dishes, but salting reduces the amount of oil absorbed. Due to its texture and bulk, eggplant makes a great meat substitute in vegan and vegetarian cuisine. Bulgur is a whole grain, usually sold parboiled and dried, that has a light nutty flavor and is a common ingredient in Armenian, Assyrian, Lebanese, Turkish, Middle Eastern, and Mediterranean dishes. Bulgur can be used in pilafs, soups, bakery goods, salads, or as stuffing. Its high nutritional value makes it a good substitute for rice or couscous. I was looking forward to making this dish because of the interesting spice mixture that is brushed on the eggplants before they are roasted, and the combination of sweet, savory, and crunchy ingredients that are mixed through the bulgur salad, and this recipe definitely delivered on the promise of great flavor and spice. This dish can easily be made dairy free and vegan by leaving off the yogurt, and the bulgur can be substituted with quinoa to make it gluten free. In a small bowl, combine 1/4 cup oil, the next seven ingredients, and 1/2 teaspoon salt. Score the flesh of each eggplant half with 15mmor 1/2 inch deep diagonal crisscrossing lines, spacing 40mm or 1 inch apart (do not cut through the skin). Drizzle 1 tablespoon oil over each cut side, allowing it to soak in. Season lightly with salt. Brush or spoon spice mix on each half diving it equally. Place eggplants, cut side up on a rimmed baking sheet and roast until soft ( about 50 – 60 min). While eggplant is cooking, place bulgur in a large bowl and cover with 1 1/2 cups boiling water. Let soak for 45 minutes to soften and absorb water. 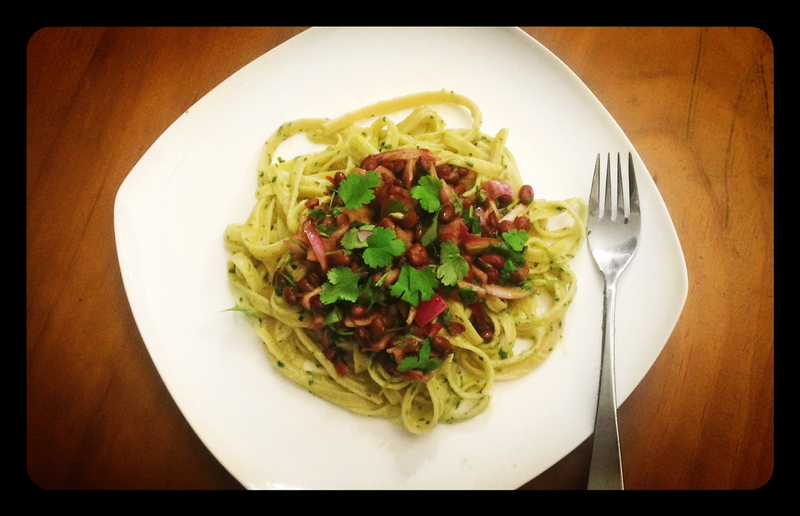 Stir in olives or capers, onion, currants, parsley, 1/2 cup coriander, pistachios, and lemon juice. Season to taste with salt and pepper, and then let sit for at least 30 minutes for flavors to meld. 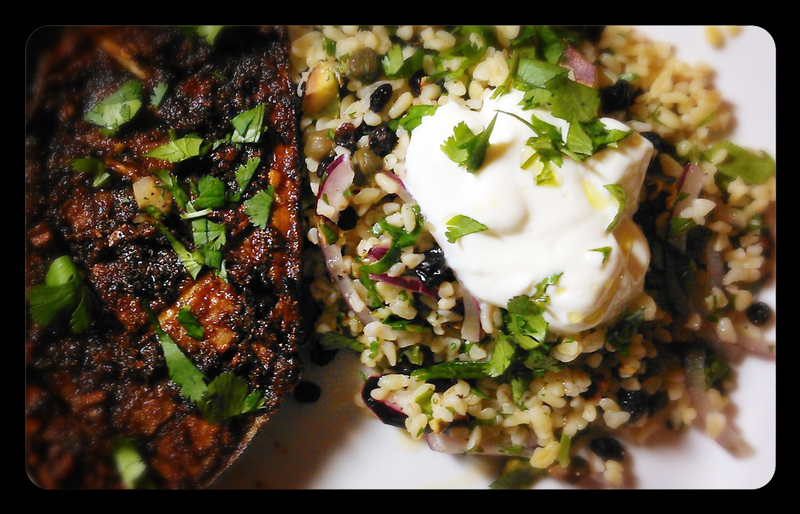 Serve at room temperature, with a dallop of greek yogurt on top of the bulgur salad and coriander to garnish.